Journal to the Self techniques help journal writers expand their horizons and flush out the valuable content in their minds. It is a wonderful way to access content for life stories, or keep a record of how your life unfolds. “There is something magical about going back into your life and observing it from the vantage point of a month, a year, or ten years later.” Your journal will chronicle your dreams, your hopes, your ambitions, your sorrows, your fears, your serendipities, and your growth. Many business people keep a business journal to document their business peaks and slump times. They use this information when sales fall off, they refer back to their journal to see what they did before when sales were low. People also use journals to take advantage of a valuable tool in the therapeutic process. When Kathleen Adams conducted a study in 1987 on writing journals as a therapeutic tool, Adams found that 93 percent of respondents said that their journals were valuable tools for self-therapy. They were able to talk to themselves on paper and work through problems. Eighty-seven percent of responses described their relationship with their journals as friendly or therapeutic. Confidant, companion, sounding board, and friend were specific words used to describe their journals. 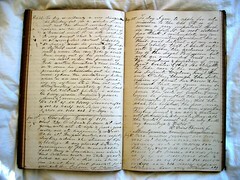 Other words described the qualities of the journals as: close, intimate, trusting, honest, caring, and nonjudgmental. Use your journal to explore your creativity. Your journal is a canvas for creative expression and imagination, you can write a poem, doodle a short story, or paint a picture with words. You can also use your journal to track the cycles, patterns, and trends of your life. Journal writing can also help reduce stress and therefore minimize health risks and reduce health issues or eliminate them all together.